Learn how to make Kraft Macaroni and Cheese gourmet with a simple box of Kraft dinner to cut down on cooking time. Pair your gourmet mac and cheese with light green salads, fruit salads, light-weight desserts such as sorbets or granitas and a variety of gourmet wines and beers. If you are wondering how to make Kraft Macaroni and Cheese gourmet, try these methods to make a box of mac and cheese as fresh and creative as mac and cheese made from scratch. Begin by making the mac and cheese dish with only high-quality gourmet cheese, such as white cheddar, gruyère or asiago cheese, and replace the boring cheese sauce from the box. Alternatively, experiment with one of Kraft's Deluxe or Homestyle alternatives that offer a range of cheese sauces; once you have made the boxed sauce, add even more gourmet cheese to your recipe. Spice your mac and cheese up with toasted bread crumbs made from scratch to make a delicious casserole baked in the oven. For a quicker way to add texture to mac and cheese, use premade gourmet bread crumbs or try one of the Kraft varieties, which include bread crumbs in the package. Toss in fresh gourmet foods, such as lobster, crab, shrimp and truffle oils along with wholesome dairy products like fresh butter and cream. Add a touch of cream cheese to yield a creamier sauce. Use fresh vegetables, herbs and spices such as garlic, leeks, organic mushrooms, Dijon mustard and your favorite seasonings. Do not forget to experiment with the different types of Kraft macaroni noodles available, such as shell and spiral rotini noodles. Gourmet mac and cheese dishes are very diverse; experiment with your favorite ingredients and techniques for a variety of tasty results. Try this quick, yet deliciously gourmet recipe made with fresh ingredients and, of course, boxed Kraft mac and cheese. 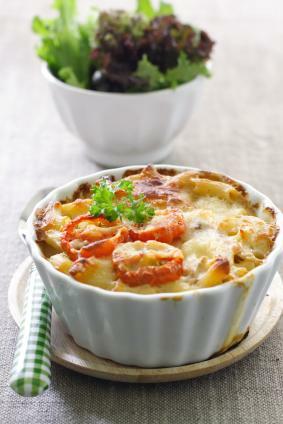 Can gourmet mac and cheese get any better than a combination of seafood and a medley of four cheeses combined with Kraft Homestyle Macaroni and Cheese? Prepare Kraft mac and cheese by following the package instructions, but cook pasta only half the cooking time. In a saucepan, slowly heat the cream until hot, but not boiling. In a skillet, melt the butter over medium heat. Add the flour, and stir constantly for several minutes. Combine the heated cream and continue stirring until sauce is thickened. Stir in the seasonings and cream cheese. Season the sauce with salt, to taste. Fold in the peppers, shallots and crab meat into the mixture. Combine the prepared Kraft dish with the skillet sauce; transfer to a greased casserole dish. Season the casserole with Kraft Homestyle bread crumbs (or topping of your choice) and fresh gourmet cheese. Bake in a preheated oven at 400 degrees for 12 minutes, or until golden brown. Experiment with pairing gourmet wines and beer with your meal to discover which ones complement your gourmet mac and cheese the best. The creaminess of gourmet mac and cheese recipes are richly enhanced with a variety of gourmet wine and beers. Try white wines and light beer with mac and cheese recipes peppered with chicken and seafood; experiment with dark ales and red wines with rich mac and cheese recipes undulated with dark truffle oils and spicy meats, such as Italian sausage and prosciutto. Combine your gourmet mac and cheese recipe with a few quick gourmet side dishes that are easily prepared at a moment's notice or prepared the night before.